Imogen and her friends Meredith and Nicola have had their fill of budget holidays, cattle-class flights and 6 a.m. offensives for a space by the pool. So when Meredith wins a VIP holiday at Barcelona's hippest new hotel, they plan to sip champagne with the jet set, party with the glitterati and switch off in unapologetic luxury. But when the worst crisis of her working life erupts back home, Imogen has to juggle her BlackBerry with a Manhattan, while soothing a hysterical boss and hunting down an AWOL assistant. Between a robbery, a run-in with hotel security staff and an encounter on a nudist beach that they'd all rather forget, the friends stumble from one disaster to the next. At least Imogen has a distraction in the form of the gorgeous guy who's always in the right place at the very worst time. Until, that is, his motives start to arouse a few suspicions . . . If I am in the need for a book to make me laugh I always know I am best picking up a Fiona Gibson or Jane Costello book as both of these ladies write fantastic books with great down to earth humour which is what I needed this week so I made a start on The Time of Our Lives by Jane Costello. Imogen is about to embark on a 5* luxury holiday with her best friends Meredith and Nicola, but she is worried about leaving her daughter behind and also taking time away from work but this break is long overdue and it is about time she kicks back and relaxes, although it soon becomes apparent this holiday is not going to be a holiday that recharges her batteries! This is going to be a perfect book to take away with you to read around the pool on your holidays this year. In true Jane Costello form there is a lot of witty humour weaved around this light, fast paced storyline that will have you snorting into your pina colada. I was laughing out loud at the “bird poo” incident among many other situations in this book. Each time you think nothing else disastrous could go wrong something else would happen to top the previous drama. Imogen and Harry are the main characters in this book and I loved them both. Harry was a pure gentleman and Imogen bless her is a bit of a clutz, bad things seem to follow her. The only little niggle I had is the girls friendship didn’t really shine through for me in this book, Imogen could well have gone away on a break on her own and the storyline would have been pretty much the same. There was a little mystery through the book surrounding Imogen's ex which was a nice touch. 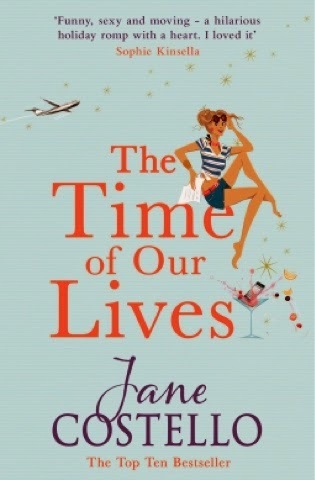 The storyline is a lot lighter than the authors previous books so there isn't much I can say in my review without giving spoilers so all I am going to say is if you want the perfect easy read for your holiday this year full of humour, disastrous situations and a touch of romance then you will love this entertaining witty read by the wonderful Jane Costello.